3021, Cream Color, Hindu Cards. This design with elegant graphic elements connects you to the ethnic roots. The front has orange and gold composition borders a spade shaped window with an orange base and embossed golden border. A casted Ganesh ji is pasted above the handmade paper paste up. An embossed pearl Om design with gold and orange scatter outline flanks it. The lower mast with the golden and orange tilak design completes the story. 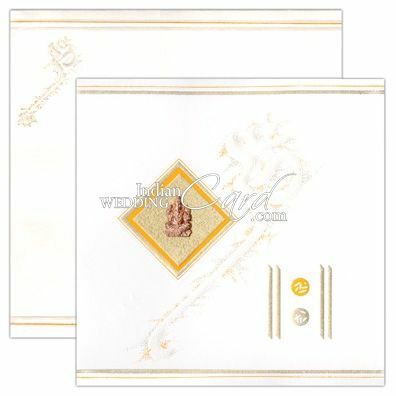 The interleaf has golden and orange line borders and the envelope has self-embossed pearl and orange borders and the front’s Om design.